Telehealth, the fastest-growing segment in healthcare, is no longer reserved for rural populations. Instead, telehealth is proving to be a game-changer across the care continuum, as the industry tests the use of tele-psychiatry, tele-ERs, tele-ICUs and even telepharmacy to bridge care gaps and to make healthcare more accessible and efficient. The percentage of healthcare organizations using telehealth rose from 63 percent in 2015 to 74 percent in 2018, according to the latest Telehealth & Remote Patient Monitoring Survey by the Healthcare Intelligence Network (HIN). 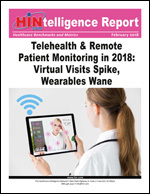 Download this free HINtelligence report for more data on on the top telehealth target, the top challenges to telehealth implementation, the primary application of data obtained from healthcare wearables and trends in remote patient monitoring usage. 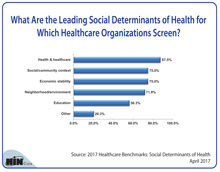 New Chart: What Are the Leading Social Determinants of Health for Which Healthcare Organizations Screen? For advertising and sponsorship opportunities in the Healthcare Business Weekly Update, please e-mail sales@hin.com or call 888-446-3530. Missed the last issue? View it here for details on results from CMS' State Innovation Model, CMS' new ruling to allow for "Incident to" billing for remote patient monitoring, details on a computer program predicts risk of deadly irregular heart beats and much more. Want to streamline your information flow? 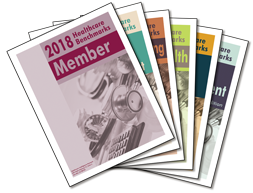 HIN MEMBERSHIPS auto-deliver each new Webinar, Benchmark Report, or Case Study at substantial savings. For information on these HIN subscriptions, contact the Healthcare Intelligence Network at info@hin.com or toll-free at 888-446-3530. What are your healthcare information needs? Email us at info@hin.com and let us know what topics you'd like to see covered in the Healthcare Business Weekly Update. © 2019 Healthcare Business Weekly Update by Healthcare Intelligence Network. E-mail info@hin.com; Web site www.hin.com.